With the institution of the Barnabites and of the Angelics, Anthony Mary had already been able to gather an abundant harvest from the field allotted to him by God. But this was not enough for such zeal as his. His heart was set on two other works, namely, the immediate reform of the clergy and bringing fervor to the heads of families in the service of God and loyalty in meeting the needs of their families. He began by inviting the clergy to spiritual conferences. He was accus­tomed to holding these with his companions in order that they might encourage each other in the love of Jesus Christ and en­kindle their zeal in apostolic ministry. Priests at­tracted by the fame which Zaccaria al­ready bore by his sanctity, flocked there in great numbers. Before long, at these conferences, were to be seen even prelates and among others, Michele Ghisleri, OP of Bologna, then inquisitor and afterwards St. Pius V.
Listening to these simple and fervent arguments through which breathed the interior charity of him who spoke, each one felt his soul deeply touched and longed to emulate even the holiest. There were among the clergy many who, by their exemplary life and ardent zeal, cooperated fruitfully for the glory of God. As Anthony Mary had thus provided for the sanctification of the clergy, he next turned his thoughts to recalling heads of families to the observance of the evangelical precepts. He established a congregation for married persons (The Laity of St. Paul). They met on certain days of the week in an Oratory of their own and held their special confer­ences with Anthony giving admonitions while also correcting faults. It followed from this, that each one entering into a better knowledge of himself and his obligations, began to work to reform himself and his family. This worked great good also for society. Moreover, Anthony Mary led them to such degrees of' perfection in the performance of their Christian duties that Magistrates often chose from among them the persons to represent the administration of public offices. From this Congregation, as branches from the stem, sprang out several others. Groups for youths, children and women were established in Cremona and else­where. Some of these groups later on, like those established by St. Philip Neri in Rome, were called Oratories. Zeal for souls drew Anthony Mary to found yet another institution, that of the holy missions. 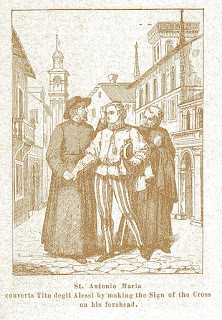 Among these, was the cele­brated mission in Vicenza. 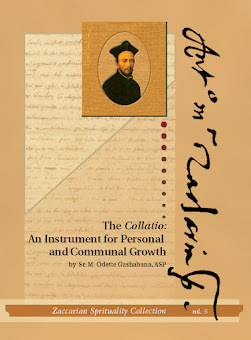 With his religious and some of his nuns, he introduced reform into the monas­teries and renewed the spirit of the citizens in such a way that many devoted themselves to the study and practice of the highest perfection. One admirable conversion was that of a young man whose life up to this time had been one of worldly pleasures. One day, as Anthony Mary was returning from the Cathedral, he met a group of merry, wild young men. Fixing his eyes on the one who seemed to be their leader, he made his way over to him, and looking at him with tenderness, made the sign of the cross on his forehead. Immediately, the youth felt his heart inflamed with heavenly fire and completely changed. Tito degli Alessi was his name, and he no longer wished to follow his companions. He renounced his worldly life to devote himself to piety. In the end, he wished to consecrate himself altogether to the service of God in the Congregation of the Barnabites founded by Anthony Mary. He became a religious of great sanctity and was the first administrator of the convent in Rome and one of the Barna­bites who worked closely with St. Philip Neri. The apostolate of Anthony Mary, the Barnabites, the Angelics, the Laity of St. Paul, the conferences for the clergy, and the missions were his holy works for the com­plete reform of society. Marvelous, indeed, they were, if we consider the evils of the times, the greatness of the under­taking, the obstacles he had to overcome and, finally, the atrocious persecutions that were raised against him. 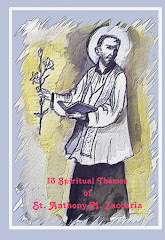 The desire now naturally arises to know from what source Anthony Zaccaria drew all the strength of his heroic charity. It is not difficult to find its true source when we reflect that he had always been, through the whole course of his life, a fervent lover of Jesus Crucified and of the Blessed Eucharist. In fact, the love for and imitation of Jesus Cru­cified was the principal intention and constant end which he proposed to his children in their practice of virtue. "The love of the Cross" became the familiar saying among them. In his letters he did nothing, so to speak but call to mind Jesus Crucified. To Anthony Mary we owe the custom, then introduced in many churches in Milan, of ringing the bell at three o'clock on Fridays to invite the people to remorse, reminding them how, on that day and hour, the Divine Redeemer died on the cross for the salvation of the world. It is certain that the first to introduce the public and solemn exposition of the Quarant'Ore, or Forty Hours Adoration of the Blessed Sacrament, was Anthony Mary. It took place, for the first time in 1534, in the little church of St. Catherine where the saint and his religious held their services. Its novelty, the magnificent decoration of the church, the vast number of lights burning before the Sacred Host, the solemnity of the ceremonies, to all of which the people were unaccustomed, moved them deeply. The ardent exhortations of Anthony Mary com­pleted the work, and the Sacred Banquet, that had so long been deserted, was now approached in great numbers. 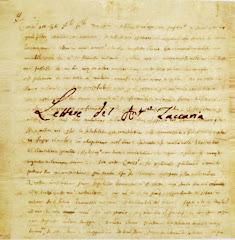 This sa­cred rite was then introduced into other churches in Milan; and when, two years later, Father Giuseppe da Ferno, a Ca­puchin, a man of great sanctity and close associate and friend of Anthony Mary, ordered that it should be held in all the churches of the city, it became almost universal. Jesus, then, who, to redeem His Spouse, the Church and render her without spot or stain, holy and immaculate, died on the cross. Jesus, victim of love in the Holy Eucharist—He it was, who spoke to the heart of Anthony Mary and infused it with such heroic charity. Anthony Mary never undertook anything without first having implored God's help in prayer. It was his chief resource in all his needs as it was his relief and comfort in his trials. During the day his time was so much taken up with the labors of ministry that he could not pass as much time as he wished in prayer. So he often spent the whole night in medi­tation and sweet communion with God. Eyewitnesses asserted that he was frequently rapt in ecstasy and sometimes also raised from the ground. Thus, the saints teach our modern re­formers and philanthropists, that it is not the man who has withdrawn from Christ who is the promoter of the civil, moral and religious well-being of the people, but he only, who identifying him­self with Christ, draws from Him life and movement. For, let it be well-understood by our modern society, Christ alone is the way, the truth, and the life (cf Jn 14:5), and without Him there can never be true knowledge nor true civilization.